As sad as it is to admit, summer is coming to an end. I feel your pain, my friend. That’s why I’m sharing a few of my favorite back to school tips to help get you ready for the busy days ahead. Let’s be honest, no one is ever really ready to go back, especially our kids! Preparing for your children to head back to class can be downright hectic. However, there are a few tips that may help make life a bit easier during this time of the year. Here are some great life hacks to get you through the start of a new year and banish some stress. Do you have any favorite back to school tips? Share in the comments! After sleeping in till late morning (or for some of us, early afternoon!) all summer long; it is tough to wake up early to catch the school bus. Try putting your alarm clock on the opposite side of the room from where your bed is. That way, when it goes off in the morning, you have no choice but to get up, since you need to turn it off. By getting out of bed, you’re sending a signal to your brain that sleep time is over. It’s not going to make you perky and alert, but at least you won’t accidentally turn it off and drift back to sleep. As tempting as it is to grab all your back to school supplies in one trip, breaking it into two sessions can save you loads of money. Before school starts, hit a few sales to pick up the items your child will absolutely need on the first day. Then, about a week after the school year, shop all the huge clearance sales for the rest of the stuff. Stores like Walmart and Target deeply discount back to school merchandise just days after the year begins in your area. One of the hardest things for kids going back to school is trying to remember their new class schedule. This is especially scary for kids starting middle school or high school. Knowing where to be and at what time can be confusing. If your tween or teen has a cell phone, have him take a picture of his schedule with his cell phone. This way, instead of trying to find the paper with the class schedule written on it, it is right at his fingertips. Older kids have to write a lot of essays in middle and high school. Want to make sure they’re getting good grades on them? Use this Google hack to find legitimate, high-authority sources. Instead of just heading to plain old Google, go to scholar.google.com. Not only does it narrow things down for you, it also provides you with the most relevant information. Another important tip: while Wikipedia should never be used as a research source, you can find quality sources through the “Notes” and “References” on their pages. They often link to high-authority sites that teachers are more likely to accept. Nothing can make homework exciting, but creating a special area for kids to sit and work can at least take some of the sting out of it! You don’t have to give kids their own home office or anything extreme. A corner of the family room with a desk and personalized accessories (like our super cute DIY personalized pencil holder) can go a long way to setting the right mood. Even a portable homework station set up on your dining room table can do the trick. Heading back to class after a relaxing summer is always going to be a bit of a challenge. I’m definitely not looking forward to getting up early again! I hope these back to school tips help make it a little easier for your family! These tips are great. I take pictures of my schedule and it has always helped me. These are all such great tips for this time of year. Thanks so much for sharing. Reminded me of my school days. After the vacations it would indeed be a struggle to get up and get ready to go to school. Waking up early is definitely one of the hardest parts about going to school, based on my previous experience. Love your practical tips! Those are some great tips for back to school! I’ll have to try the alarm clock trick! Oh these are awesome hacks. I remember those first few weeks struggling with my school schedule! Taking a picture of your schedule with a phone is a good idea. I accidentally clicked on that ad below the post comment and my long comment disappeared … sigh. I like the tip about blow drying your shoes to make them fit. I’ve never heard of that one. Also, while I like the site you mentioned, Wikipedia does provide some very good research and sources, we just have to do our research thoroughly and choose the options we like best. Ooooo great hacks! I can’t believe school is about to start! Taking a picture of the schedule with their cell phone is genius. My kids are out of school but I love that tip and I am going to pass that on to friends and family. 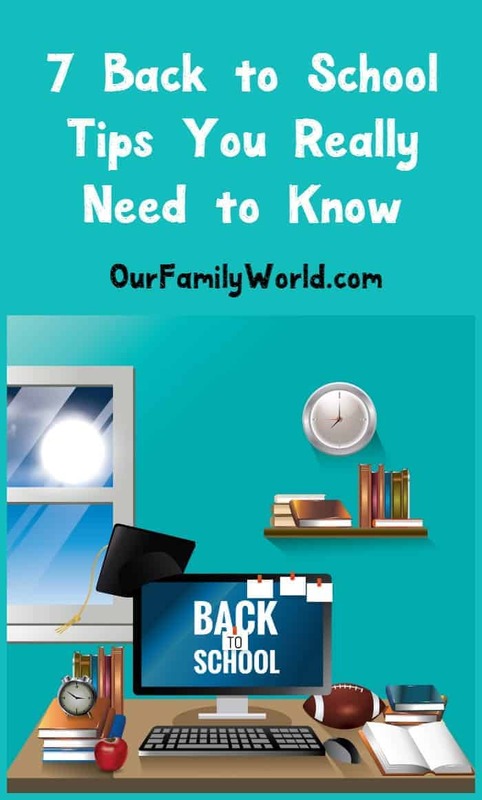 These are all great tips for parents who have children who are heading back to school. Thankfully, I have kids who like school and don’t fuss and grumble too much about their school responsibilities. I love that reading idea! Probbaly because I love gummy bears! Great post! I sure wish there was something like scholar.google.com. when I was in school! Od course back then we didn’t have computers either–it was off to the library or use the set of World Book encyclopedias most of us had in our homes! You know, it’s been a long time since I’ve been to school but I still have difficulty waking up in the morning!! Just not a morning person I guess 🙂 Your tip on putting the alarm out of arm’s reach is great!